The Flyers lead the season series 2-1. Ottawa is 2nd in the Northeast (7th in the Eastern Conference) with 88 in 77. The Sens are 19-13-6 on the road this season. Over their last 10 games they are 5-3-2. Ottawa is coming off of a 6-4 win over the Jets on Monday extending their win streak to 2 games. Going to need Erik Karlsson to continue to provide offence from the back end, and for Spezza, Michalek, and Alfredsson to provide offence upfront. The Flyers are 5th in the East (3rd in the Atlantic) with 98 points in 77 games. They are 21-12-5 at home this season. They have gone 6-3-1 in their last 10 games. The Flyers beat up on the lowly Leafs last night with a 7-1 drubbing. Rookie Matt Read leads all rookies in goal scoring with 23 and ranks 4th in points with 46. Sean Couturier ranks 10th in scoring for rookies with 25 points. As always, Claude Giroux is a talented young player and leads his team in points and assists. Watch for him to try and pick apart Ottawa's defence and try to find leading scorer Scott Hartnel. No half way about this one.... JUST WIN. Isn't the season series 1-1-1? Bryz should be back in net for the Flyers. shabbs wrote: Bryz should be back in net for the Flyers. So was his foot broken or was it not? Maybe we should just make sure and brake it better. The seriousness of this game can't be underestimated... right Spezza? Not sure if they did anything for it. Flyers play Sat and Sun... so "returning this weekend" could be either of those games. wprager wrote: Isn't the season series 1-1-1? Nope, as Yahoo said: Sens trail 2-1. But of course you are separating losses and overtime loses, when it is just easier to say they have won 1 and lost 2, instead of saying won 1, lost 1, and lost 1 in overtime. Wow, really...drive the net hard, make him work. 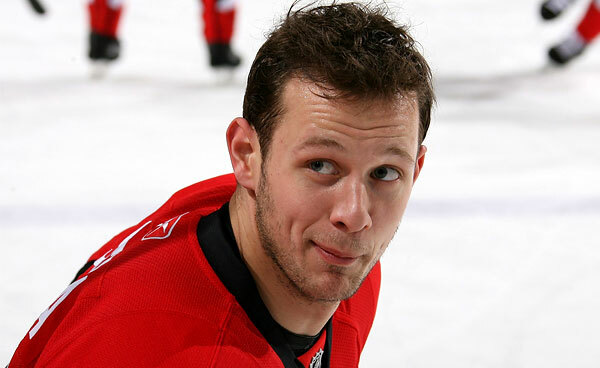 shabbs wrote: The seriousness of this game can't be underestimated... right Spezza? He seems to be saying "Right, shabbs."